With comprehensive and extensive all-in-one manufacturing, finishing and prepping facilities in Greece, Dimar can provide a complete service for all aluminium extrusion requirements. Having been established for over 20 years, we primarily deal with large European manufacturing clients and have built long-term supply relationships spanning over 10 years with several important customers. Dimar prides itself on producing some of the highest quality profiles at some of the most competitive price points in the European extrusion industry. With our brand new anodisation facilities operating on the same extensive Greek site as our existing aluminium extrusion and powder coating plants, Dimar is pleased to be able to offer a complete “ONE STOP SHOP” for extruded aluminium profiles. i. Technically advanced electrostatic powder coating facilities offer a full spectrum of RAL colour choices to finish each aluminium profile, with both vertical and horizontal finishing lines for a professional finish to any extruded profile shape. i. Ultra-modern anodisation facility offers aluminium extrusion finishes in silver matt (etched), silver pearl, and silver polished effects including ultra-bright silver and high-grade chemically brightened options. ii. Dimar's anodisation baths are 7.2m in length, allowing anodisation of profiles of up to 7m in length - significantly greater than many specialist anodisation facilities in Europe are able to offer. i. Dimar’s extensive manufacturing plant covers 170,000m2 and operates 3 separate modern extrusion presses with a combined capacity in excess of 45,000 tonnes per annum, providing sufficient profile capacity for the most demanding clients. ii. Dimar offers extrusion of any profile that can be included within a 220mm diameter circle. iii. Dimar can produce profiles with a normal minimum thickness of between 1.1mm to 1.2mm based on a standard material specification of aluminium alloy BS1474 6060 T6, although other minimum thicknesses may apply to alternative alloys. iv. Dimar extruded shapes are produced to a tolerance within BS1474 and EU guidelines, unless otherwise specified. v. Dimar profiles are generally supplied to customer specified lengths. Normal minimum profile length is 3m and normal maximum profile length is 7m. In certain cases profiles in mill finish can be supplied in lengths up to 12m. vi. A dedicated research and development department based in Greece ensures extrusion production techniques remain at the forefront of technology, resulting in excellent quality profiles produced in the shortest possible lead times at market leading prices. vii. Full EN ISO14001:2004, ISO 9001:2000, IFT Rosenheim, AAMA and QUALICOAT factory certifications to guarantee product quality and support our commitment to environmental sustainability. Additionally, our facilities incorporate state of the art chemical waste processing units, an aluminium recycling foundry and triglycidyl isocyanurate (TGIC) free environmentally friendly dye casting. ix. Guided visits of our production facilities are encouraged for all internal audit, environmental reporting, quality conformance and social responsibility requirements. x. Dimar is able to extrude dies with a theoretical weight of up to 12kg/m - this figure is limited by the power requirements needed to stretch the extrusions immediately following extrusion to ensure the profile remains square and true as it cools. xi. Dimar operates a sophisticated electronic coding system for all profiles which is linked to an online ERP system, ensuring all production is precisely regulated and tracked throughout the production process. 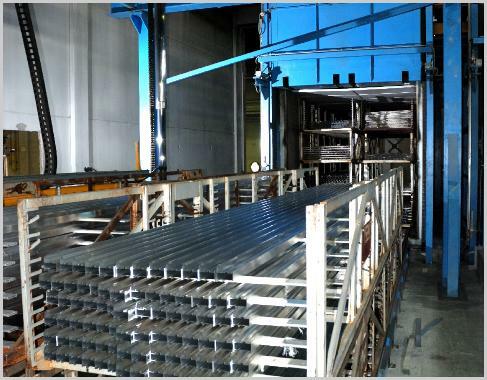 This system also ensures that the profiles are efficiently moved between production processes at the plant, minimising the potential for delays to the production schedule. xii. Dimar has the capability and capacity to supply annual profile weights from 10 tonnes to >1000 tonnes per customer - we are happy to answer enquiries from prospective customers about annual capacity requirements and minimum order quantities. i. Possible to produce both polyamide and hot resin finishes. ii. Full prepping and cutting facilities. iii. Cutting of sections <3m with accuracy of +/- 0.01mm. i. New dies - from 5 working weeks from receipt of approved Dimar die drawings and Dimar die samples. ii. Existing dies - from 3 working weeks from receipt of order (please contact us to discuss exact delivery schedules as these will vary depending on each profile’s required finish and supplementary fabrication requirements).